Hope dope de ope dope... let's see. I got a B- on my midterm. I reckon I'm pretty happy with that. We watched the end of that Warren Beatty movie with the football and the Chris Rock and the Julie Christy and the WAHOY! My face is on fire. I didn't get a single goddamn thing done last night with this book idea. After I built it all up on here. So next time, I'm not gonna tell y'all about it. I'm just going to do it. That way if I fail, no one watches me plummet in flames. It's my own personal scarring failure. No one else gets to watch. Unless they pay me. 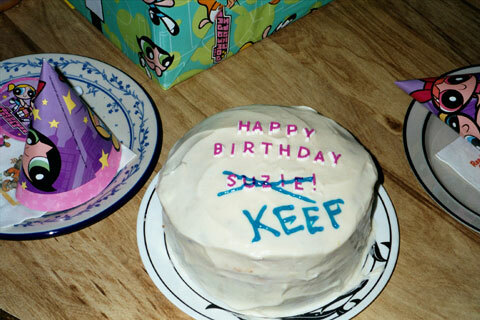 Here is a picture of the birthday cake I got last year. I did start work on another project today, one not unrelated to the book idea. In fact, they're sort of related, you might say. Heh heh. Oh yes, very related indeed. Heh heh. Mwahaha. NYUK NYUK NYUK NYUK! I've been reading Cruddy, the Lynda Barry novel. I like it a lot so far. It was recommended highly. Tonight I'm going to see that new flick The Score. What a cast. I've heard mixed reviews. I'll let y'all know how I feel about it. If you want me to, anyway.